Finally found a net cafe (well, ice cream shop!) with Picasa and a fast connection. 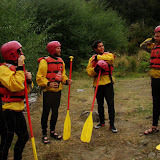 Here´s the "pro" photos from our rafting trip last week.